We are closed for the 2019 season.Thank you for visiting our site. Please visit us next year to order your cake! Our Economy Package is for the no frills approach to enjoying Mardi Gras. None of the fancy throws, just a delicious 2 pound Gourmet King Cake, a plastic Mardi Gras baby, and a Taste of Mardi Gras flyer. The King Cake will serve 15 - 20 people. The Parade Package has been designed to give you the feeling that you have just left an authentic New Orleans Mardi Gras parade. 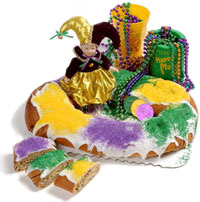 The Parade Package contains a 2 pound Gourmet King Cake, 3 Mardi Gras throw beads, 3 Mardi Gras throw doubloons, a plastic Mardi Gras baby, and a Taste of Mardi Gras flyer. The King Cake will serve 15 - 20 people. 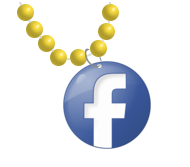 Our Deluxe Package has been put together for the Mardi Gras "newbie" to give the ultimate feeling of actually being at a Mardi Gras parade. The package consists of a 2 pound Gourmet King Cake, a Mardi Gras can insulator, an 8 inch jester doll, a Mardi Gras throw cup, 3 Mardi Gras throw beads, 3 Mardi Gras throw doubloons, a plastic Mardi Gras baby, and a Taste of Mardi Gras flyer. 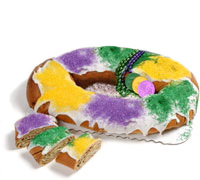 The King Cake will serve 15 - 20 people.